Fresh veggies are something that I look forward to every summer. And not just any fresh veggies either. The hubs and I don’t have our own garden (I’ve been known to kill plastic plants), but we have plenty of friends and neighbors who do! So far this year, we have been gifted with a bag full of NC grown sweet onions, brightly colored banana peppers, cucumbers, and zucchini and squash. 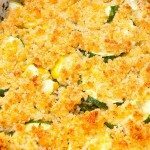 My mom is probably going to die…just DIE…when she sees that I am not only eating squash casserole, but that I’m actually cooking it myself and posting the recipe to prove it! When I was little, my mom tried to get me to eat a few bites of squash casserole that she had made. I absolutely refused to touch the stuff. And I sat at the table with my arms crossed just a huffin’ and puffin’ away b/c my mom refused to let me get up from the table until I tried it. Finally, after what seemed like days, I gave in and tried it. And then I involuntarily got my mom back for torturing me with the stuff. Let’s just say the carpet in her beautifully decorated dining room never looked the same after that night…and my mother never again forced foreign foods into my mouth. Lucky for me, I fell in love with squash years later, and haven’t stopped eating it since. 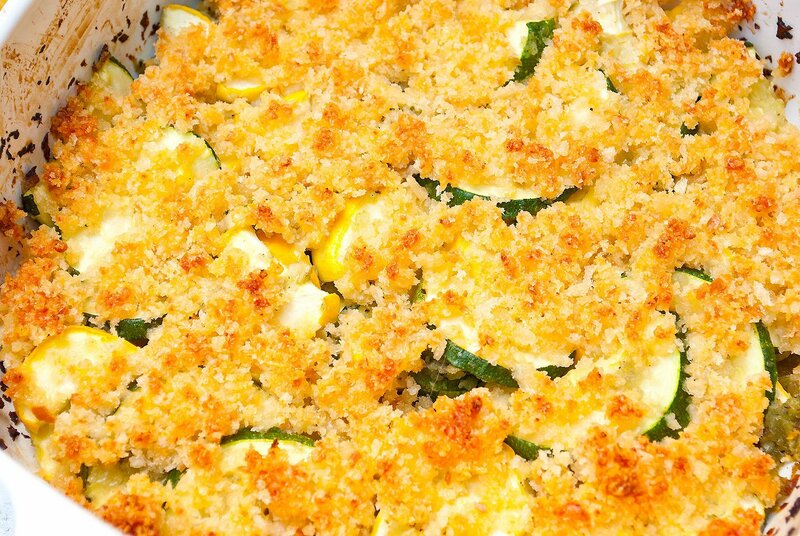 This casserole is light and healthy and is in no way overloaded with copious amounts of cream, butter, cheese, and eggs that most Southern casseroles are known for. In fact, the butter and cheese can only be found in the topping of the dish. The topping is crunchy and munchy and OH SO GOOD! And, as it probably is with most of us, it’s my favorite part. 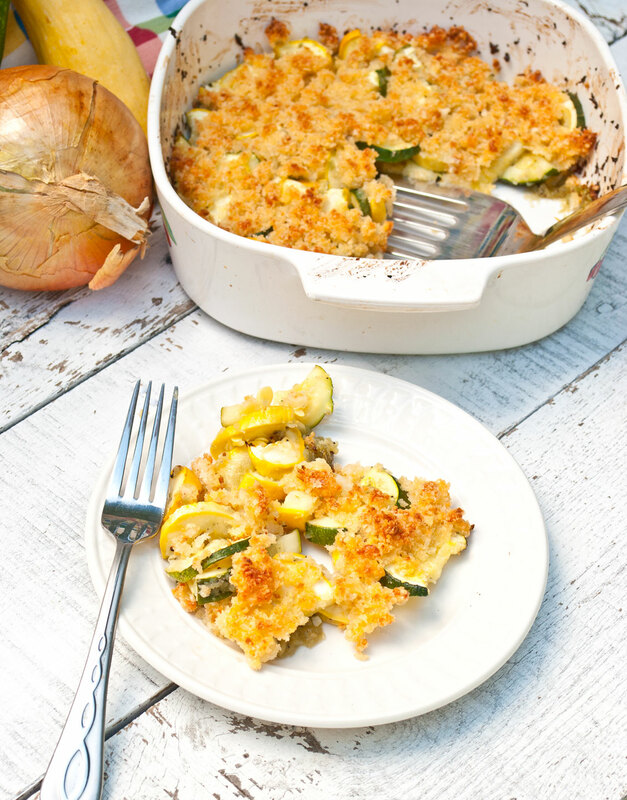 Panko bread crumbs and soft and smoky gouda cheese take this casserole to a whole new level, but the smokiness doesn’t overtake the flavor of the vegetables themselves. It just adds a hint of yummy goodness that enhances the brightness of the dish. A slight note of freshly ground nutmeg also adds a smidgen of sweetness and creates a depth to the dish that just isn’t the same without it. Did your parent’s ever force veggies down your throat? What is a vegetable you can’t stand? 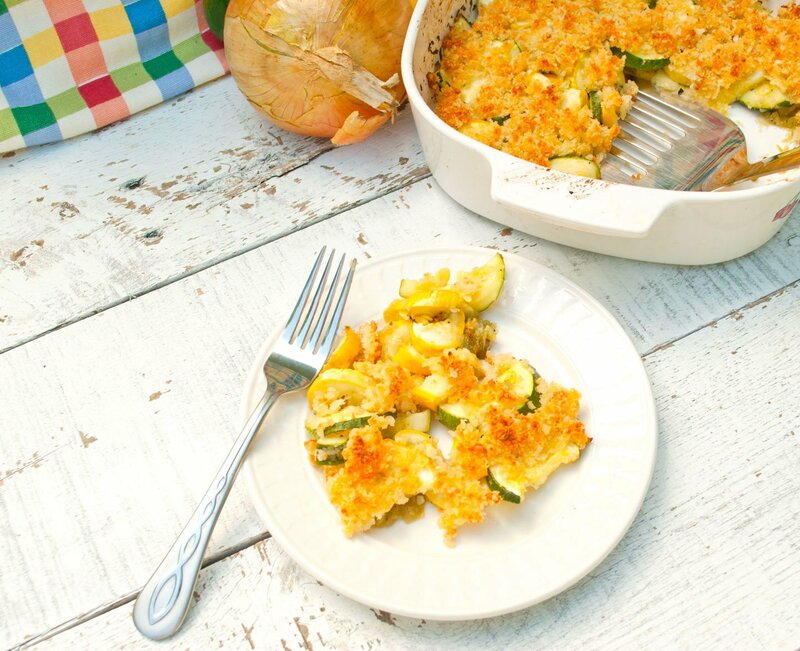 Place sliced zucchini and squash in a small casserole dish. Heat a sauté pan over medium-high heat, add olive oil then onion, garlic, salt, and pepper and sauté until translucent and slightly browning around edges, about 3-4 minutes. 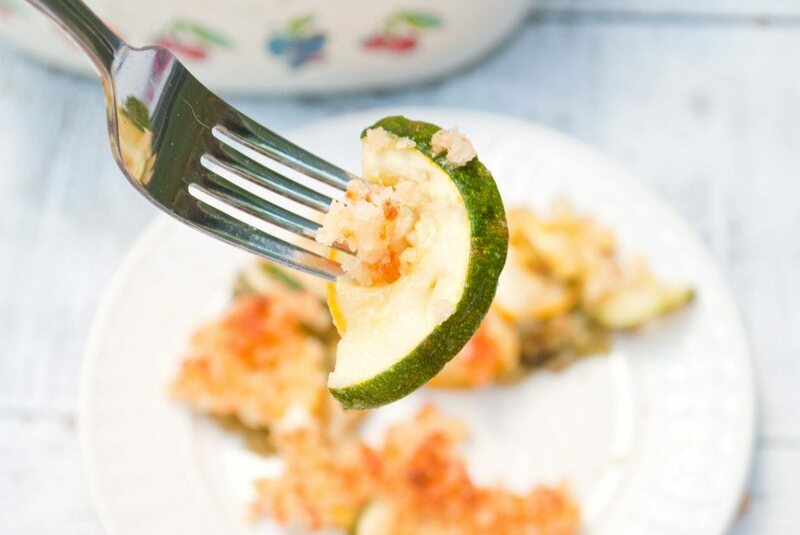 Add the onion mixture to the casserole dish and stir until evenly distributed around the zucchini and squash. In a food processor (or even using clean hands) pulse/squeeze together the bread crumbs, cheese, butter, and nutmeg until it just sticks together and is thick and crumbly. Crumble the bread crumb mixture over the top of the casserole. 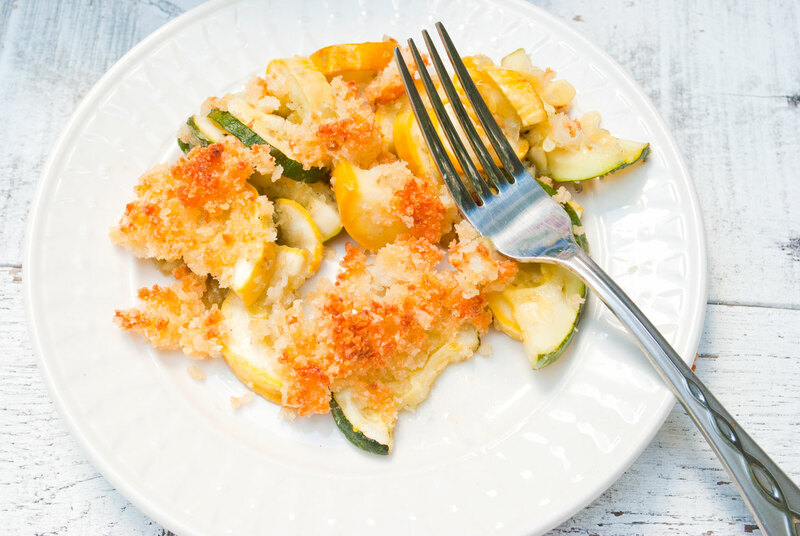 This looks so tasty – but sadly, I’m not a fan of squash or zucchini. I always get myself into trouble this way…seeing pretty foods online, thinking they must be better than the way I’ve been preparing similar ingredients, then not liking them any better when I eat them. Le sigh. As an aside, I’m the worst biscuit maker EVER! I tried again last night using a King Arthur recipe – and those are always spectacular. I got a sort of spongy shortbread 🙁 Any tips from my favorite southern cook? Mia, I am still looking for that perfect biscuit recipe! I used to have one that was absolutely delicious and would knock your socks off…but they were made with butter flavored crisco!!! I *can not* justify that anymore!!! I’m still working on one and will get it posted as soon as I can. It’s really hard to test biscuit recipes in the south during the summer. All the butter melts before you can get the dough kneaded! I’m always looking for new things to do with courgettes and this sounds lovely. My parents always made me eat my veg and I’m so grateful to them for it now! I’m so grateful that I love veggies now too! I love them so much. Especially brussels sprouts! They are like candy to me!